I just want to let you all know that I’ve spent about three hours over the past couple of days yelling at my computer. I’ve been trying to format the new cover for my paperbacks so I can get them back to market, and boy, has it been a pain in the rear. You can upload a front cover, and pick one of several fill colors for the spine and back, which are automatically formatted with your text. You can upload a front and a back cover, and have an automatically formatted spine with the same predetermined options of fill colors. You can upload your own cover in its entirety, but it’s one flat image, which means you need to figure out how big the spine is and plan accordingly. Let me just say right now that the biggest obstacle in this entire process has been the fact that you can’t just pick your own bloody HEX code for the fill color. If I could, this would have been a piece of cake, and I wouldn’t be complaining right now. I’d have sacrificed the fancy little decal on my spine, opted to upload my own front and back, and had them figure out the rest. But no. If you want to use the auto-formatting, you have to pick from a selection of somewhat garish colors CreateSpace has selected for you, none of which even remotely matched my dusty blue cover, or any of the colors in it. So I opted to go really crazy and do a full cover by myself. No problem, right? Take the front cover, add the back cover and an approximate spine based on the real life copies I have already, flatten image and boom. Right? No. Of course not. Just some of the many, many different images I’ve had to work with lately. 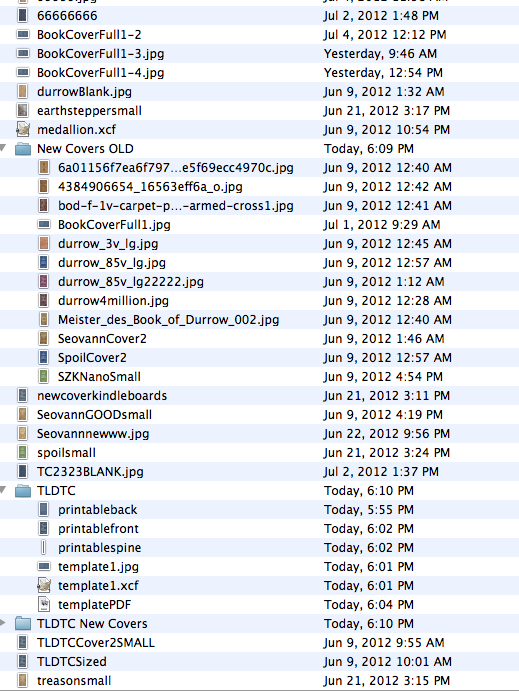 My filing system makes perfect sense to me, thank you very much. I was aware that there’s a large bleed area to take into account, and I usually handle that by putting a blank border around the image, which is the part that gets cut off instead of my actual artwork. What I wasn’t aware of is how much room the spine fold takes, and the fact that they kept cutting off almost twice the bleed they said they were going to, chopping off the edges of my image to an unacceptable degree. And the kicker? They don’t actually show you any of that until after you’ve gone through the 48 hour review process! They don’t give you the actual guidelines on the image until after you’ve waited forever! So I’ve gone through review after review, making minor tweaks and changes, wasting time and patience on something that should be a snap. It’s infuriating, and completely unnecessary. Give me the guides beforehand, and I wouldn’t keep going nuts! Alas, that would be too simple. I think I’ve finally gotten it into decent shape, but I won’t know for another two days, of course. It’s not that I’m in a rush or anything, it’s just that wasted effort irks me, and I feel bad verbally abusing my computer over something that really isn’t its fault (although GIMP crashing every thirty seconds is another issue). So once again, I’m going to wait patiently (ha!) for my latest file review, and hope that this time I get lucky, because I think that luck is really just about the only thing this whole process runs on. Here’s crossing my fingers. No, luckily you can do a digital proof without ordering a hard copy each time. I’d be a lot more upset if I had to pay for all of that!